Back in the day when I was just beginning to blog, interesting senior bloggers were hard to find. I searched for connections so I could build some kind of a community of my own but all I could find was AARP and stuff about being a grandmother. I was a not interested in either of those.That was more than 10 years ago. here on blogspot. 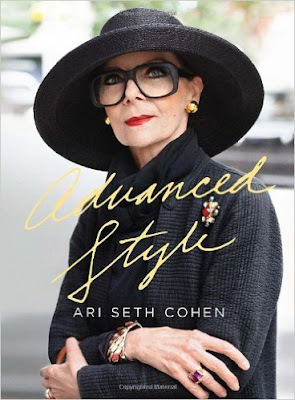 Ari was simply fascinated with old women and the unusual style worn by those that ventured out. He photographed women on the streets of New York City everyday. It was a very good day when I found his blog. As his audience grew the parade of beautiful ladies emerged and I found it almost addicting. I checked on him several times a week. He even linked to a blog that I used to own called Always at Home. All I had to do was answer his call for senior bloggers. I was looking for connections too. It was lonely being the only "old" person out there. Now Ari has grown into an institution, shoots for magazine like Grey and has even released two coffee table books and a coloring book. Advanced Style, Advanced Style: Older and Wiser, and Advanced Style the Coloring Book are available on Amazon. I thought that most of the ladies he pictured in the early posts were just people he ran into on the street. It was an eclectic mix of beautiful glamorous and down to earth real women. But as time passed one woman stood out as part of the Advanced Style world. She was one of his favorite (and mine too) models and a good friend to him. Her name is Ilona Royce Smithkin and she was a star in the video he produced. She is in and of herself a star of sorts. She is an artist with a studio in Provincetown, Mass. and a home in Manhattan (I think). She wears very long red false eyelashes and always dresses as though she is about to break into song. She was in her late 90s the last time I checked. The thing is, I do not know these people...I only follow from afar. But it is the small connection in this blogging world that keeps it interesting. I keep hoping that Ari will come to Phoenix again one in the winter to promote a book and I will get to actually meet him. What a privilege that would be. But until then, I continue to peek in through the window. 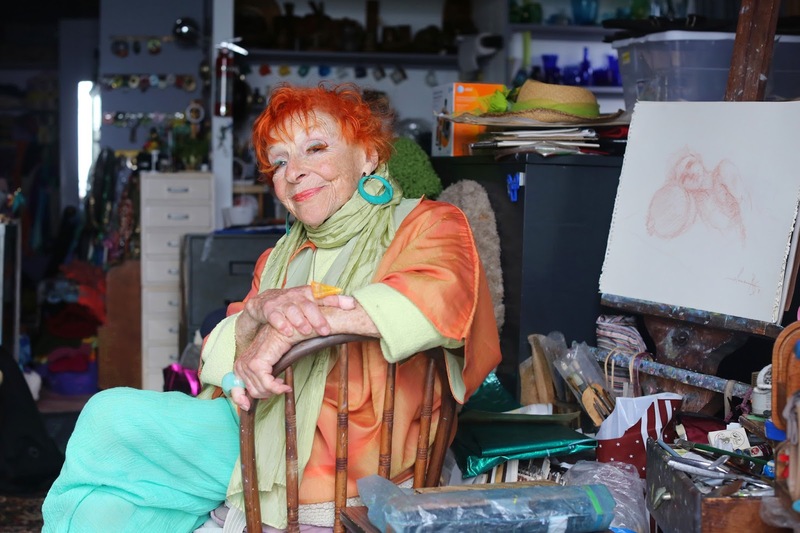 After all, I can relate to all of those old women and I do love their artful style. In my fantasy world, Advanced Style and I are like this (my fingers are crossed)! Who do you follow faithfully in the blogging world? DJan...how long have you been blogging? Yes I discovered Ari and Advanced Style years ago. I had to wonder if New York created an atmosphere where women could live colorfully. Me too...did that place breed a different kind of woman or was it culture based on ethic background? I love the eclectic style of Advanced Style. I follow a lot of mature women bloggers and it thrills me that there are so many of us! I even follow a couple of bloggers who are in their 80s and I love to read their wise outlooks on life and how content they are with who they are. I will check your blog and see if I can find those you follow. It is very interesing, because when I started there was NO ONE!!! I also follow "Advanced Style" - for fashion for all ages "The Vivienne Files" is excellent. "The Hostess of the Humble Bungalow" is a wonderful over 60 blogger and always has wonderful photos on her site.